When we built the TASER Smart Weapon, our engineers had three thoughts in mind: safety, accountability and performance. Unlike their predecessors, our Smart Weapons are built on an all-digital platform. They have the ability to regulate charge output, perform health checks, update firmware over the web and provide analytics displaying how and when someone uses the weapon. The numbers tell the story, TASER products save lives, prevent injuries, reduce litigation and save agencies a lot of money. More than 700 reviews have affirmed the safety and life-saving value of TASER technology as a safer, more effective use of force. TASER weapons exist to save lives. Law enforcement officials rely on our weapons to protect life, and we continue to innovate today, leading the world in electrical weapons technology. Our Smart Weapons specifically target the motor nerves that control movement, which enhances the effectiveness of restraint while minimising harm – an alternative far superior to using firearms in many contexts. A U.S. DOJ-funded study by the Wake Forest University Baptist Medical Center (U.S.) concluded that 99.75% of 1,201 field uses of TASER weapons in a wide range of drug and alcohol influences, ages and races resulted in no significant injuries, demonstrating that the TASER device is the safest intermediate use-of-force option for police. In a longitudinal study, the Houston Police Department saw TASER devices help decrease workers' comp claims by 93%. Deploying alternative means of force has also been shown to reduce suspect injuries by as much as 60%. In a peer-reviewed study, published in the American Journal of Public Health, MacDonald, Kaminski and Smith examine less-lethal weapons including conducted electrical weapons. Analysing data from 12 police departments across 24,380 use-of-force cases involving injury to officers or civilians, this study found that ‘odds of injury to civilians and officers were significantly lower when police used CED weapons’. 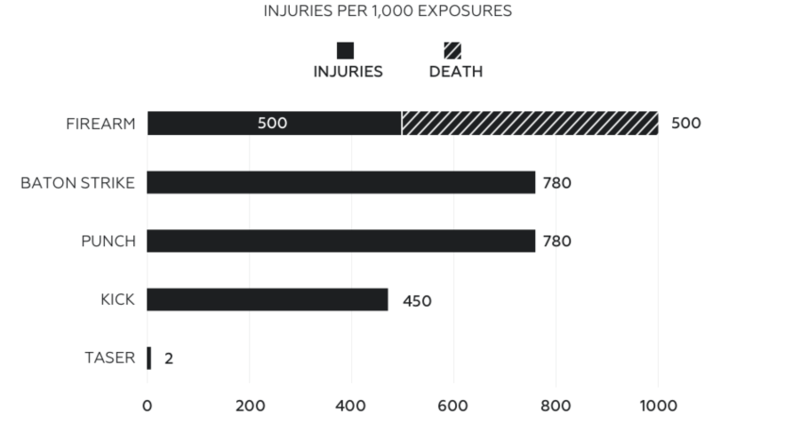 Overall, the study concluded that when law enforcement agencies responsibly employ less-lethal weapons instead of physical force, injuries can be dramatically reduced. In a five-year TASER safety study by the US Department of Justice an expert panel of medical professionals concludes that, ‘the use of conducted energy devices by police officers on healthy adults does not present a high risk of death or serious injury’.